Remember the movie "Finding Nemo"? Well this turtle kind of reminds me of the turtle in the movie even though it's not really him. But isn't he cute? 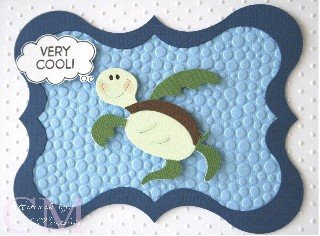 This is from the Sizzix sea animal set that was released last month. Sizzix sea animal set, Cuttlebug embossing folders swiss dots and (not sure what the other dotted one is called), Sizzix frame die, and Hero Arts stamps. If you're in for a cute little Christmas project to make, I'll be at Ben Franklin Pearl City this Saturday doing a make-it take-it for their paper party. He's adorable. Oh bother...another thing to add to my want list! 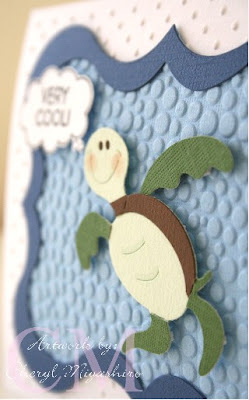 I love the turtle...I was totally debating on whether to pick one up from your husband's store...too cute! Cheryl, this is sooo cute! Thanks for sharing! I love all of these dies. Very cute...gotta get the sea life dies! Ahhh cute, your right he does look like Crush from Finding Nemo. Hi Cheryl! Love the look on that turtke's face!! Such a cute card!!! I just love that turtle. I think I need to get that die cut.